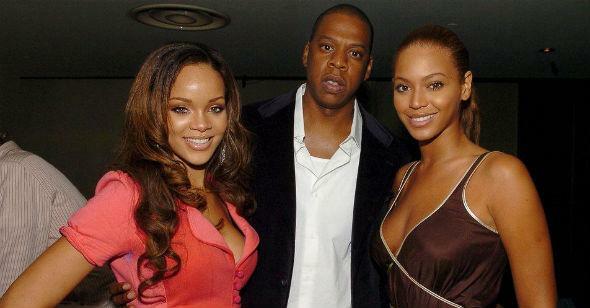 *Rihanna’s crazy life has not only gotten on Oprah’s nerves, but Beyoncé is feeling it too. According to the UK’s Now Daily, the diva is tired of hearing about the drama-filled life of her former lil sis. Sources say it’s time for the royal Hip Hop family to cut all ties. “She’s told Jay that RiRi’s beyond hope and just isn’t their problem,” a source said. While Rihanna was once to Jay-Z what Nicki Minaj is to Lil Wayne, her recent public trials, most notably her on-again-off-again love triangle with Chris Brown, has apparently strained that mentee-mentor relationship. “This drama has been going on for so long and people get hurt because [Rihanna] won’t grow up,” said the source. Rihanna is just a wild child without a purpose. While Beyoncé is a formidable celebrity personality, her counterpart has been quite the opposite, from cursing the world out on her Twitter to getting down and dirty in public in front of cameras. It’s not a good look for Bey or Jay, the source said. That horse left the barn a loooong time ago.